Princess of Rock Jessie Chung’s new English album Be Strong is on a roll! To celebrate Jessie’s recent outstanding achievements, Future Entertainment Music Group Australia held a “Double Chart-Topper Celebration” for her. 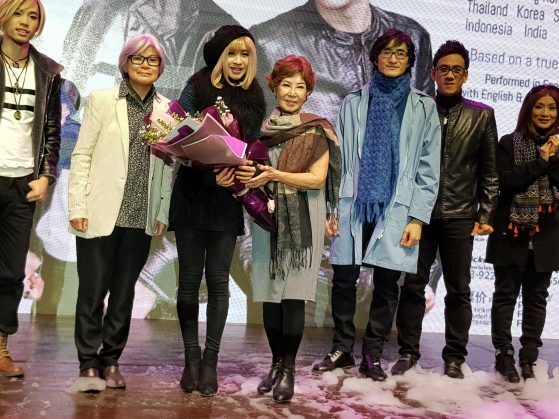 Princess of Rock’s new album Be Strong entered into two of Taiwan’s most prestigious and authoritative charts, Five Music’s International Chart and I Radio’s International Chart, topping both of them with back-to-back number one hits. Many international artists also entered into Five Music’s International Chart and i Radio’s International Chart, including Adele, Ed Sheeran, The Chainsmokers, Arian Grande, Madonna, Coldplay, etc. On YouTube, the music videos of Be Strong garnered more than 3 million views within two months of their upload! Jessie Chung’s album Be Strong sold more than 15,000 physical copies in three months, and for this accomplishment, she was awarded with a Platinum certification from Chairman of the Recording Industry Association of Malaysia (RIM) and Managing Director of Warner Music Darren Choy and CEO of Malaysia’s physical record distributor PMP Entertainment Lim Kim Sow. Jessie’s artist manager in Australia, Neil McLean (former bureau chief at Seven Network and Channel Ten, former presenter at Southern Cross Television, former news director/newsreader at Prime Television, and former chief of staff at WIN Television, has 33 years of experience in the media sphere) also brought a precious sword as a present for Jessie. ** The rankings of i Radio’s International Chart is determined through internet polling, i Radio DJ votes, total airplay, and total record sales (5 Music, G-music, Books.com.tw).